In this series we take a look at some resources that can help get you up and running with C#, whether you're a beginner, an intermediate, or advanced programmer. Let's dive in! Microsoft heavily supports C#, issuing fixes and updates rapidly – so it’s a more readily updated language compared to other languages, such as Java. Like Java, C# is one of the most popular programming languages, and as such, it has a large, active user community, making it easy to find troubleshooting solutions and coding help on StackOverflow and other online communities. With the release of .NET Core, we think that C# and .NET Core will be in huge demand in 2018. Be sure to check out our article on why .NET Core is the next big thing. Programming languages have come a long way in terms of being easy to learn and understand. 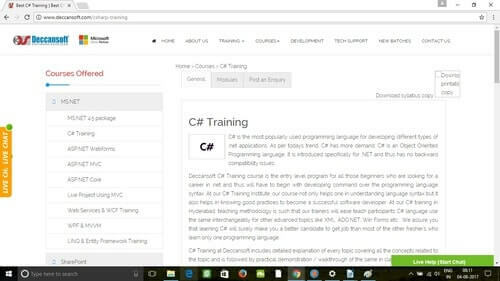 C# is a versatile programming language, and after learning it, you can apply your skills to a variety of things. With C#, .NET, and Visual Studio, you can build an endless variety of applications, from web apps to mobile apps, REST APIs, and more. Whether you’re learning C# for the first time or ramping up your C# expertise, we’ve rounded up 30 of the best tutorials for both beginners and advanced programmers to get you started. Data types, classes, and variables. In this tutorial by author Gerry O’Brien, topics covered include core language elements such as data types, variables, and constants. It also features a short tour of two fully-functional Windows Phone and Windows Store apps to motivate you. There are also five challenge videos that allow you to test yourself, along with another five videos that explain the answers. Managing resources with the garbage collector. 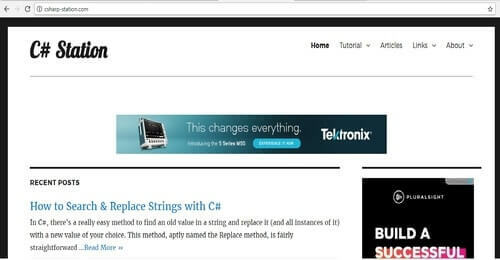 The C# Station Tutorial is a set of lessons suited for beginner to intermediate-level programmers who are ready to learn hands-on with a compiler and an editor. Topics cover everything from the basics right up to Polymorphism and Overloading Operators. This series of tutorials from Deccansoft is led by Mr. Sandeep Soni, a Microsoft Certified Trainer, and covers almost all C# topics from the ground up. Each concept is explained at length using different walkthroughs and practical approaches. 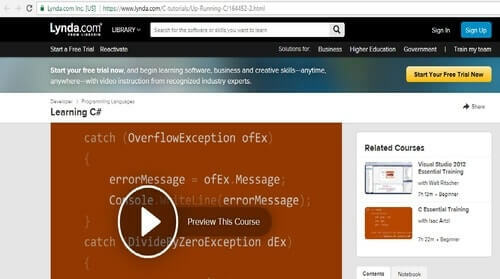 The entire course is quite lengthy and features 26 modules split up into about 83 hours of video! It is advisable to have a working knowledge of any one programming language before you take this course. Concepts behind CLR (Common Language Runtime). Building a standard GUI for Windows based applications using WinForms. Developing scalable applications using multithreading features of .NET. This tutorial comes from edX, an online educational services provider which also offers some courses from top universities and colleges. This is not a beginner’s course and requires you to have a prior understanding of programming concepts. This tutorial by Gerry O’Brien is better-suited for existing programmers who want to learn a bit more about C# and the .NET environment. 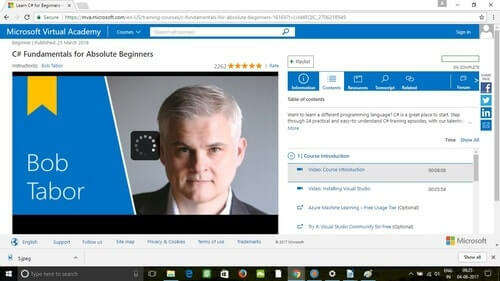 This C# tutorial from none other than Microsoft takes you through 24 practical and easy-to-understand episodes with Bob Tabor from the Developer University. Apart from teaching you the fundamentals of C#, this course also covers the tools, how to write code, debug features, explore customizations, and more. The cool thing is that each topic is a separate video that’s quite straightforward. This course also teaches you to apply your C# skills to video games and mobile apps. Creating and understanding your first C# program. Understanding Data types and Variables. Learning how to work with Date and Time data. 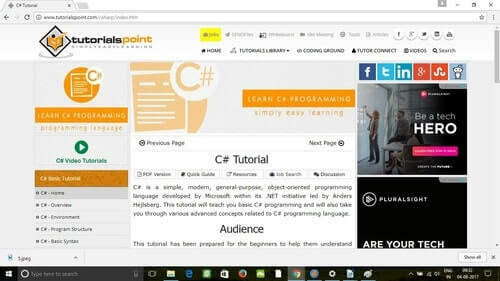 Tutorialspoint, which is quite a popular online destination for learning, has 2 tutorials on C#, one for beginners and another for more advanced programmers. Both are great learning resources, and between the two, they cover the basics of C# programming and also delve into more advanced C# concepts. These are text-based guides with step-by-step instructions and examples. Udemy is one of the largest online learning platforms with thousands of courses and a big budget to spend on advertising. If you watch YouTube videos or even just browse the web, you’ve likely come across their advertisements. 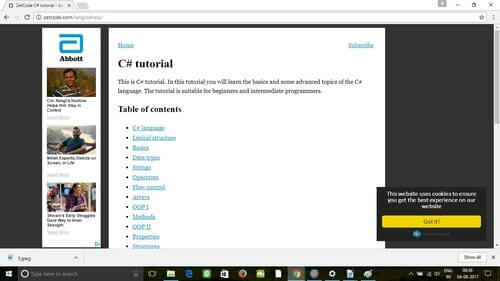 While the website has many video tutorials on C# programming, the good ones aren’t free but aren’t unreasonably expensive either. This particular course helps students think like programmers and learn C# practically by working on programming projects. The course consists of about 49 lectures and is just under 9 hours in length. Practicing loops, arrays, and structures. 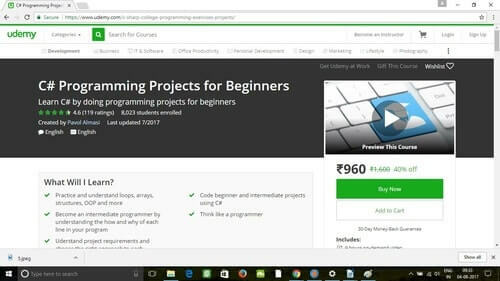 Start coding beginner projects immediately. This is a free online interactive tutorial for C#. 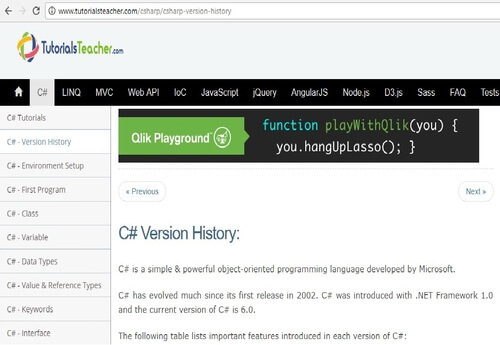 In fact, the entire website is dedicated exclusively to teaching C#. This site is different in its teaching approach in the sense that it teaches you with two windows, one for code and one for your output. This all-text tutorial from Zetcode focuses on both basic and advanced topics and is suitable for beginners and advanced programmers alike. This tutorial covers the basics like loops, strings, and arrays and then moves on to more complicated stuff like delegates, namespaces, and collections. It also covers the new features of C# 4.0.